Well the bad boys and girls of golf are back in OG2 and it's more thrills and spills than you can poke a stick at. It's funny that they've taken a game and incorporated a redneck element, which despite my preconceptions actually makes it a good bit of fun. 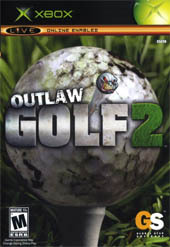 I do think that in some cases the developer might have shot themselves in the foot by taking this tack as it will lose gamers who just love golf, however I can tell you that OG 2 is a damn solid game of golf and actually loses points due to the redneck factor being so prevalent. This is not because the game is not fun, however the soundbites are just a bit too repetitive as they have tried too hard to make sure that every element of the game has been commented on, including every hole or so it seems. As a result we get hit up with a fair bit of repetition which takes away a bit from the overall fun as the audio gets monotonous after a while of same old same old happening. Course layout is pretty standard and well thought out, although I must say that the actual locations that the games take place on are a lot of fun. They range from all sorts of urban environments that you can take advantage to make for some fairly innovative golf. There is a putting system that is also pretty cool and makes for some really nice control with a targetting mechanism that allows for some accurate putting that is actually up there with what you could expect from a Tiger Woods Game. For those of you who loved the first Outlaw Golf and the sort of chicanery that it involved, well, we've got you covered with OG2 composure meter. Yes that's right, you screw up and your on screen character starts getting upset and then you start getting more and more shots wrong as they are too upset to play properly. Would you like to beat up your caddy? That might bring down your pounding heartrate somewhat and let you get on with the game right? Guess what? You can! Just use the tokens that you earn during the game and you too could find yourself slapping around the stick carrier and whacking the ball directly into a spectator's face. This version of the game has more online options than it's predeccesor and for those of you who want bragging rights there is a world wide leader board that you can get into and you can also smack talk your way through a round as you and some mates tee off together. It really is a cool game and the fact that there is a runaway element to it certainly helps the fun factor to what is otherwise a pretty tame sport in comparison to others. There are quite a number of courses there on the game and although there are some of the ones from the first title, they have all been updated and there are some nice new ones to sink your teeth into. The Live connection will allow you to get more courses as they become available along with new clothing for the scantily clad girls. In a move that I found pretty cool, there is a mode that let's you set up the shot and actually run through the whole shot in a ghostly mode so the ball is not hit and you essentially get another chance at glory. This is offered only once per shot or so and you will find that the course is pretty difficult as a result of this opportunity that is given to players. There is the opportunity also to get perfect shots by taking place in mini games where you get to go "ghetto" and drive around suped up carts. Win the obstacle course and you'll get the flaming club of perfection. In fact there are so many mini games in this title that your head will swim and I found it so much fun that after the initial few rounds, I played game after mini game and simply did not get sick of it. When it comes to golfing games, I would say that this is the best currently on the market hands down. Even if you took the over the top factor out of the equation then you are left with a fantastic golf game that all the golf nerds are going to love. All these changes however, make this a game that the rest of us are going to enjoy.